The media is suddenly obsessed with 'Alt-Right, as FoxNews reporter Howard Kurtz says in the article below. The term "has been wildly popular for the last 10 minutes". The Washington Post said it this way; A whole lot has been written lately about the alt-right, that insurgent, Internet-born identity movement that seems dead-set on swallowing the Republican party whole. Brietbart defines the alt-right this way. The alternative right, more commonly known as the alt-right, is an amorphous movement. Some — mostly Establishment types — insist it’s little more than a vehicle for the worst dregs of human society: anti-Semites, white supremacists, and other members of the Stormfront set. They’re wrong. Previously an obscure subculture, the alt-right burst onto the national political scene in 2015. Although initially small in number, the alt-right has a youthful energy and jarring, taboo-defying rhetoric that have boosted its membership and made it impossible to ignore. It has already triggered a string of fearful op-eds and hit pieces from both Left and Right: Lefties dismiss it as racist, while the conservative press, always desperate to avoid charges of bigotry from the Left, has thrown these young readers and voters to the wolves as well. This shows the impact of the mainstream media in picking up on negative images and then turning them into something to be used against conservative candidate and now president -elect Trump. Are right wing fringe groups worse than left -wing fringe groups which get little or no reporting? A Partial List of President Trump’s Accomplishments So Far. You won’t hear this from the dishonest “fake news” media. They like to focus on “fake scandals” – such as their “Trump Colluded with Russia” Hoax or his latest tweets. The “fake news” media won’t tell you what President Trump has actually accomplished in his first year in office – which is truly historic. For example . . . The Trump Economic Record President Trump pushed Congress to enact the largest tax cuts for the American people since President Regan. He cut the top tax rate on business from 35 % to 21 % – to make America an attractive place to build a business again. President Trump has signed more laws to slash unnecessary federal regulations and bureaucratic red tape than any President in American history. This slashing of regulations is saving American businesses more than $18 billion a year in costs. President Trump is emphasizing making America energy-independent. He has approved the building of the Keystone XL and Dakota Access pipelines. President Trump has saved the American people $3 TRILLION over the next 10 years by withdrawing from the so-called Paris climate accord. The economy under President Trump is growing twice as fast under President Trump as it was under Barack Obama. The U.S. economy has created more than 3,700,000 new jobs under President Trump. And the unemployment rate in the manufacturing sector has dropped to a record low of just 2.6%. 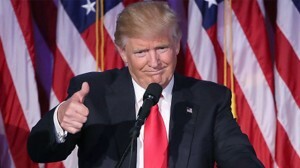 More than $9 TRILLION in new wealth created under Trump. Consumer confidence (which drives economic growth) is at an 18-year high under President Trump. Average hourly wages up. As a result, welfare rolls are decreasing as more Americans are getting off the sofa and going to work. Food stamp use has plunged to an 8-year low under President Trump. Why is this happening? Simple. Unlike Barack Obama, President Trump is not waking up every morning thinking up new ways to attack American businesses. Unlike the socialistic anti-capitalist Obama, President Trump is pro-business and pro-capitalism. As a result, we have returned to Reagan-levels of economic growth. Ending ObamaCare When Congress was unable to get the votes to completely END ObamaCare, President Trump cancelled much of ObamaCare on his own. Specifically, President Trump. Ended the billions of dollars in illegal taxpayer subsidies for insurance companies. Made it easier for lower and middle income folks to buy health insurance by allowing people to buy plans off the exchanges that are half the cost of the ObamaCare Bronze plans. Gave the green light to the formation of association and co-op plans, which would allow small businesses and even individuals to group together across state lines, giving them the same purchasing clout as large multi-state employers. Announced the IRS will no longer fine people who don’t have health insurance because, if they can’t afford the health insurance, they probably can’t afford the fines either. Ended the outrageous Obama requirement that you must purchase health insurance that includes coverage for abortions. Upon President Trump’s urging, Congress ended the ObamaCare mandate that all individuals must purchase a government-approved health insurance plan, which Congress then passed. President Trump continues to push weak Republicans in the U.S. Senate to keep their promise to completely repeal and replace ObamaCare. Securing America’s Borders Illegal border crossings have dropped 35 % under President Trump. In fact, illegal aliens are now leaving America on their own. President Trump is doubling the number of border patrol officers. President Trump has declared war on the 10,000 ultra-violent MS-13 gang members who are in the United States. Most of these gang members came to the United States during President Obama’s “open border” policies – when President Obama deliberately ignored U.S. immigration law in order to create more voters for his socialist agenda. Stopping Our Government from Punishing Christians for Their Faith President Trump’s issued an Executive Order prohibiting the U.S. government from discriminating against Christians or punishing expressions of faith, affirming First Amendment protections for religious freedom. This Executive Order also requires the U.S. government to vigorously protect and defend religious freedom and public expressions of religious faith. This Executive Order ends the Obama Administration’s illegal misuse of the Justice Department and other federal agencies to prosecute and persecute Christians who express their faith. Destroying ISIS and Making America Strong Again President Trump is allowing America’s generals to decide how to destroy ISIS. Since President Trump took office in January, every ISIS stronghold in Iraq has been destroyed. Because of attacks on ISIS ordered by President Trump and his generals, the founder and leader of ISIS Abu Bakr al-Baghdadi is now dead (SOURCE: Newsweek) and the entire leadership of ISIS has been decimated. ISIS is in retreat everywhere. More than 50,000 ISIS fighters have been killed since President Trump was sworn into office. ISIS is now a shell of what it was when it grew to prominence under the weak and feckless leadership of President Obama. President Trump applied very tough economic sanctions and military pressure on the North Korean dictator Kim Jong-un. The result: Kim agreed to end his nuclear weapons program, allow inspections of his nuclear sites to make sure they really are shut down, and has ended North Korea’s 68-year state of war with South Korea. We don’t yet know if the North Korean dictator will follow through with what he agreed to. But we can be confident President Trump will hold Kim Jong-un accountable to his promise. President Trump is proving every day that “peace through strength” works. President Trump has reversed President Obama’s policy of allowing transgendered people to serve in our military because the military is no place for progressive social experiments. Instead of spending billions of dollars on special health care needs for transgendered soldiers, President Trump has decided this money is better spent on weapons and soldiers who are fit for duty. After years of cuts to our military under President Obama, President Trump has signed into law the largest increase in defense spending since the Reagan years. President Trump is calling our enemy its proper name – radical Islamic terrorism. Transforming America’s Courts After years of President Obama packing our federal courts with more than 400 radical Left federal judges, President Trump has been appointing more than 150 solid Constitutionalists to our federal courts, including Neil Gorsuch and Brett Kavanaugh to the Supreme Court – both solid conservative Constituionalists in the tradition of the late Justice Antonin Scalia and Justice Clarence Thomas. Just imagine the kinds of radical anti-Christian judges and Supreme Court Justices we would be getting if Hillary Clinton had been elected President. Protecting the Right to Life President Trump has given states the option to deny Planned Parenthood access to Medicaid and other federal grant money because Planned Parenthood uses this money to facilitate its conducting of more than 328,000 abortions per year at Planned Parenthood’s abortion mills. President Trump has ordered a halt to all U.S. taxpayer money going to international organizations that fund or perform abortions. Vice President Mike Pence President Trump chose Governor Mike Pence as his Vice President. He could not have picked a more rock-solid conservative. In fact, all of President Trump’s key appointments have been rock-solid conservatives. This is essential because “Personnel is Policy.” Breaking Up the Left’s Control of Education in America President Trump has directed our conservative Secretary of Education Betsy DeVos to end the anti-Christian so-called “common core” curriculum that was aggressively promoted by Obama. Establishing Law and Order in America In sharp contrast to President Obama’s rhetorical war on America’s police, President Trump is outspoken in his support for America’s police and has offered cities federal support to crack down on violent crime in our city streets. The result: Murders and violent crime are dropping in most cities under President Trump instead of rising as was happening under Obama. And this is just a partial list of what President Trump has actually accomplished so far as President. Everyone is underestimating Trump. It could hurt Democrats and Republicans alike. What did Jeff Flake do for the GOP in the Senate? How Many Opposing Protest Groups were Present in Charlottesville? "We condemn ... this ... display of hatred, bigotry and violence, ... on many sides ..."
Are right-wing fringe groups any worse than left-wing fringe groups? STAND WITH TRUMP AGAINST THE COUP!